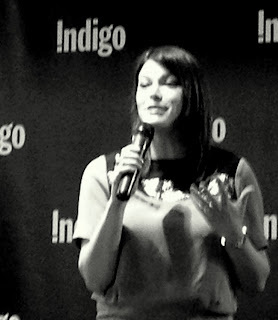 Last night I met the lovely Gail Simmons (Top Chef judge, host of Top Chef - Just Desserts and Special Projects Director at Food & Wine Magazine) - she's eloquent, she's inspiring, she's Canadian. This talented lady from Toronto started out with four simple words as inspiration for what to move towards after graduating from a degree that left her uninspired: Eat. Write. Travel. Cook. Now she does exactly that for a living and I wondered how? How does one go from career indecision to a career in delicious? I picked up a copy of her new book, "Talking with my Mouth Full: My Life as a Professional Eater" and devoured it, hoping for an answer, and got one - hard work, humility, perseverance, a dash of good luck, and a willingness to do what is necessary. In Gail's case she earned her Top Chef judging credibility by interning at Toronto Life Magazine and writing for the National Post, attending culinary school, getting seasoned working the line in NYC kitchens (Le Cirque & Daniel), and doing countless hours of legwork researching and testing recipes as Jeffrey Steingarten's (Vogue's food critic extraordinaire) assistant - which she did despite knowing she did not care to be a chef! I thrilled at all the twists and turns her story took and related to her struggles and triumphs along the way. I thought - Gail and I, we're not so different. We both like to eat, travel, write, and cook. 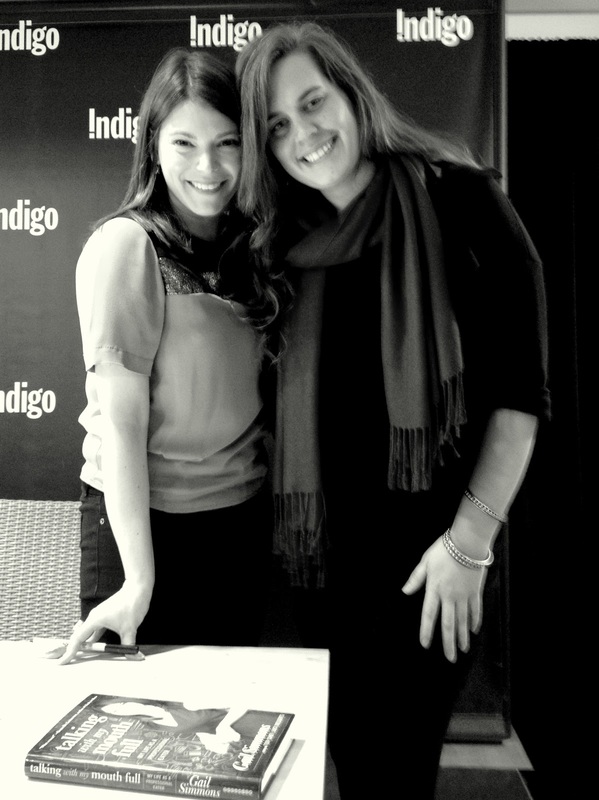 We're both Toronto gals who have large appetites and large bosoms (we bonded over how this sometimes helps and hinders, agreeing to embrace our voluptuousness). Gail is a culinary kindred spirit - the kind of woman you could easily sit at a kitchen table with, drinking coffee, eating baked goods, sharing stories about the things in life that taste good or the kind you just want to spit out - she's a real girl, and does not hide or gloss over the difficulties she's experienced or apologize for the heights she's attained. Which brings me to wondering - if Gail Simmons were to join me for such a visit, what would I make the woman who's used to being fed by the best of the best? I choose the humble scone - a baked good I have an excellent relationship with - these scones are the perfect texture combination of buttery flake and moist crumb. They are soft, sweet pillows of butter-meets flour indulgence - so good my friends will cross the entire city to my kitchen at the mere mention of them. These scones are simple, delicious, and perfectly accompany a heart-to-heart. There is a longstanding debate as to the pronunciation of 'scone' - does it rhyme with 'moan' or 'gone'? Whenever I make scones, I tend to both moan and find they quickly disappear. In my mind, anything that promotes a buttery flake or acts as a vehicle for more butter automatically gets my vote and I couldn't care what you called it - Fat Rascal, Rock Cake, Singing Hinnie (yes, those are the alternatives, or so Wikipedia tells me). I admire the versatility of this baked good - its ability to taste incredible on its own or the way it takes on flavour based on the addition of ingredients both savoury and sweet. Today, it's pumpkin pie reinterpreted, scone-style. Cinnamon and nutmeg meet pumpkin and vanilla sugar in a scone that's not too sweet and perfect served warm with butter and homemade preserves or fresh whipped cream with a touch of vanilla. With a mixer (feel free to use a pastry blender, food processor or two knives), cold cubes of butter are cut into a mixture of flour, baking powder, sugar and spices until coarse crumbs form. In a separate bowl, pumpkin puree, milk, an egg and vanilla are whisked together to a creamy consistency. 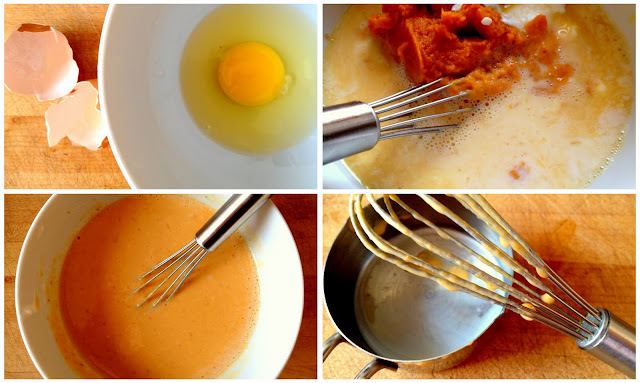 At this point, the paddle attachment is switched out for the dough hook attachment and the creamy pumpkin mixture and the flour/spice mixture are mixed until they come together - no more. The dough is then smoothed out with a rolling pin, gently patted down on a liberally floured surface, and cut in the desired shape. A drinking glass dipped in flour works well to cut circles if you don't have a pastry cutter. The tops of the scones are brushed with a little cream and put in the oven until golden brown. A little pat of soft butter that melts on contact, or some vanilla-infused whipped cream paired with a spoonful of my friend C.'s strawberry preserves and I'm in breakfast ecstasy. Combine dry ingredients. Add cold cubed butter and cut into the flour until mixture resembles coarse meal. 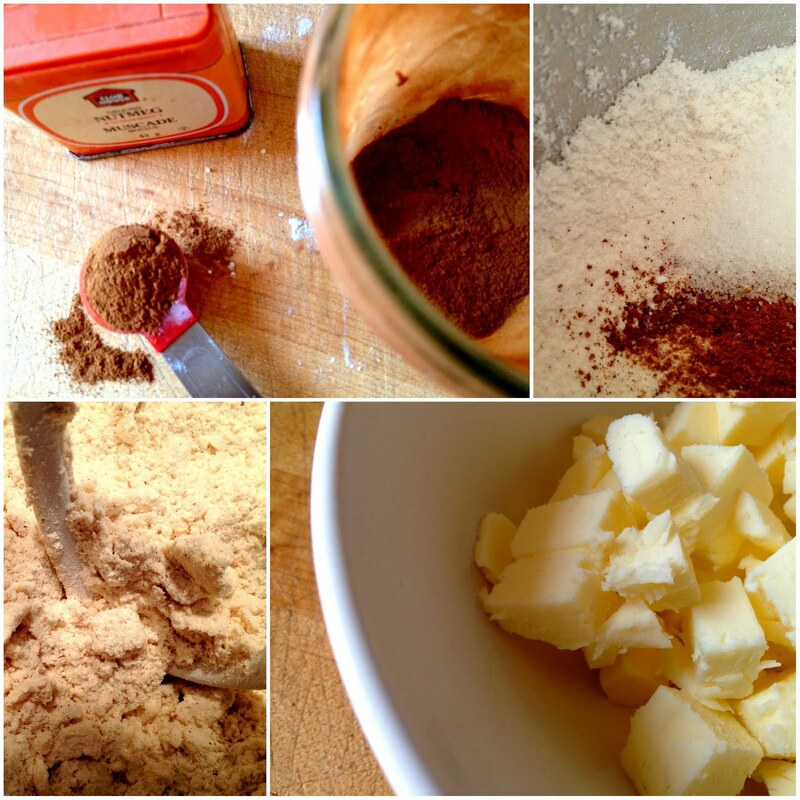 Combine the liquid ingredients and add to the flour/butter mixture and stir just until the dough forms a ball. It will be sticky, but that is a good thing. Simply flour your hands and your work surface liberally and roll out to about an inch thick, shaping into a rectangle. Cut shape of choice and place almost touching on a parchment-lined baking sheet. 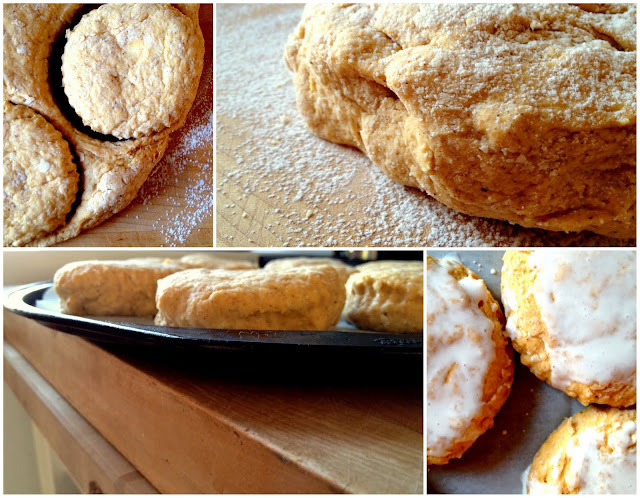 Brush tops of scones with cream and bake until golden brown ~ 10-15 minutes. These scones taste like Thanksgiving feels - in this case, mimicking the flavours of a pumpkin pie (enjoy with whipped cream!) while inspiring gratitude for connecting with someone who inspires you. 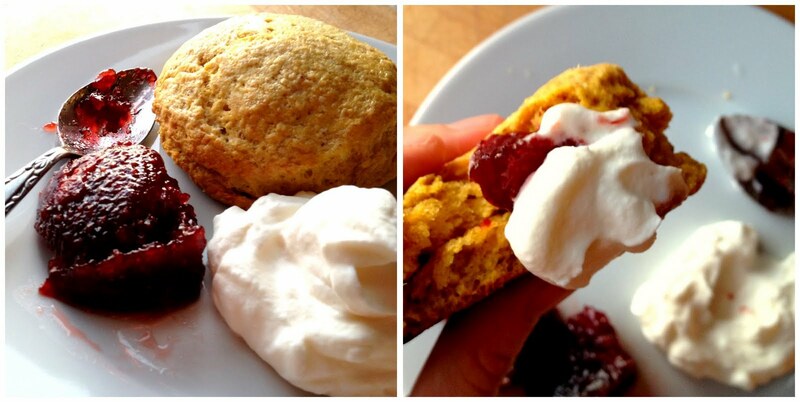 Loving your adaptation of the scone too - sounds very delish! My scones rhyme with moan... but my British fam's scones rhyme with gone. And here in Hamburg Germany, I worked in a little cafe where I made them and they really didn't even know what to do with them never mind what to call them. No offense to my German husband or friends! There is clotted cream in the grocery store on a regular basis, so I let it go. I've experienced the Hamburgian Scone Scorn firsthand when relatives have come to visit (I have lots of family in Hamburg) and they don't quite know what to make of them at first, but usually end up requesting them for breakfast over and over. I can't imagine a world without scones - and yours look lovely. What a great idea to keep the ingredients in ready-to-scone bags in the freezer.